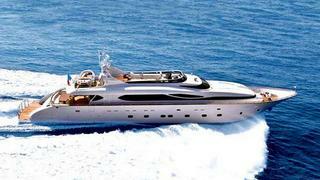 A call to Pacifica in Greece brings news that they've signed the 35m motor yacht Paris-A for sale. Built to RINA class by Italy's Maiora yard in 2009, Paris-A accommodates 10 guests in a master suite, two VIP staterooms and two twin cabins while twin 2740hp MTU engines give her a cruising speed of 23 knots. Lying in Athens, Paris-A is asking €4.9 million.